New services and capabilities are being made available to cloud computing environments on an ongoing basis. Taking advantage of these new services and capabilities is important to enhancing and improving your cloud environment and your business. Being able to manage these changes and your overall cloud environment is critical to ensuring you are providing a reliable operating environment for your organization. IBM® Cloud Manager with OpenStack for z Systems™, V4.2 provides advanced OpenStack integration and cloud virtualization and management capabilities for IBM z™ Systems. Incorporating open technologies makes it easier for businesses to adopt a cloud model and integrate it with their existing IT infrastructure and applications in order to meet their evolving business needs. 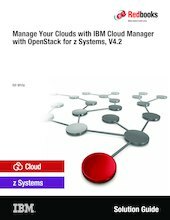 This IBM Redbooks Solution Guide describes IBM Cloud Manager with OpenStack for z Systems, V4.2 and gives you insight into its wide range of capabilities. The Solution Guide explains the business value of the solution. It also provides an overview and high-level architecture of the solution and includes usage scenarios. Both supported platforms and ordering information are provided in the Solution Guide.